COLLINGWOOD father-son prospect Jake Kelly will get his chance to win a place on the Magpies' list after being invited to the NAB AFL Draft Combine. 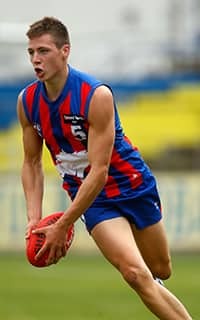 Kelly, the son of 1990 premiership player Craig, was not on the initial 98-player list to attend the national combine at Etihad Stadium in October. But after some impressive displays playing in Collingwood's VFL side, the strong-bodied midfielder was one of 11 players added to the group. Craig Kelly played 122 games between 1989-96 for the club as a key defender. His son has played 10 games for the Oakleigh Chargers. If the Magpies are keen to draft Kelly they can nominate him as a father-son and see if any club bids on him at the NAB AFL Draft. If he doesn't get picked in the national draft, the Magpies can then nominate him as a rookie selection. Among the others to be newly announced attendees at the combine are two American prospects Jason Holmes and Mark Cisco. The pair, along with Patrick Mitchell, trained with the Sydney Swans earlier this year before the Swans signed Mitchell as an international rookie. Left-footed medium defender who provides excellent rebound for his team and can match up on both taller and smaller opponents. Competes well in the air and showed his promise in 10 games with Oakleigh Chargers, averaging 19.4 disposals. Also played at VFL level with Collingwood and was among the teams best against Werribee. Son of former Collingwood defender Craig Kelly. Tall defender who can play on the talls and smalls. Strong overhead mark and very competitive by nature. Uses the ball effectively. Played seven games for Sandringham. Played two games for Vic Metro in the U18 championships, averaging 12.5 disposals. Tall forward who is strong overhead both on the lead and in contested situations. Kicked 51 goals this year in the TAC Cup competition and represented Vic Country in the under-18 championships. Reliable set shot for goal, good below his knees and has an outstanding work ethic. Tall defender born in Kenya of Sudanese heritage who has developed into a rebounding defender but can also go forward and kick goals. Strong overhead, with good natural leap. Moved from Queensland to WA this year and has represented both states in the AFL U18 Champs in the last two years. Tall forward who presents well and is a strong overhead mark and accurate in front of goal. Mobile and is a good decision maker. Suffered broken collarbone in round five and missed the NAB AFL Under-18 Championships. Can also provide an option in the ruck. Represented WA at under-16 level in 2011 and under-18 in 2012. His round 15 game against South Fremantle was one of his best this year, with 22 disposals, seven marks and kicking five goals. Ruckman with good athletic ability and has a real physical presence. Had an injury interrupted year, breaking his tibia in round one after representing WA at the under-18s in 2012. Returned to play at Colts level for the last six games of the year. Plenty of upside but has the physical size to compete at senior level. AIS-AFL Academy Graduate. Medium midfielder who is extremely agile, poised, is a neat kick and strong overhead. Takes the game on with his line-breaking ability. Played for Queensland in the NAB AFL Under-18s in 2012 with a shoulder reconstruction curtailing his progress early in 2013. His 21-disposal effort in round 22 against Gold Coast in the NEAFL was an impressive performance. Mobile ruckman/key forward who is strong overhead and reads the game well. Has strong work ethic and is extremely competitive by nature. Produced his best in a representative game between NEAFL and the SANFL at under-22 level with a best-on-ground performance having 20 disposals, taking 12 marks and kicking two goals. Ruckman who is very athletic and uses the ball well by hand and foot. Has progressed from the under-18s, playing 12 games at reserves level at Glenelg. His best game came in round 21 against North Adelaide, when he gathered 13 disposals and 29 hit-outs. Potential ruckman from Columbia University with a basketball and NFL football background. Imposing athlete with a great appetite for the competition. Has a natural leap (standing vertical jump - 70cm, running vertical jump - 85cm). Has a double degree in political science and psychology. Potential key position player/ruckman from Moreland State University in Kentucky with a multiple sports background in basketball, soccer, NFL football, baseball and golf. Was introduced to Australian football at the USA Combine in April, 2013, where is vertical jump scores (standing vertical jump - 78cm, running vertical jump - 91cm) were impressive. Left footer who looked very natural with the ball by hand and foot.